There’s something particularly enchanting about islands. Being on a piece of land surrounded by water seems to create an inimitable feeling of separation and serenity. When an island features 17-miles of undeveloped shoreline, more than 9,000 acres of federally designated wilderness, lush maritime forest and feral horses, the sense of enchantment is apt to be even more profound. 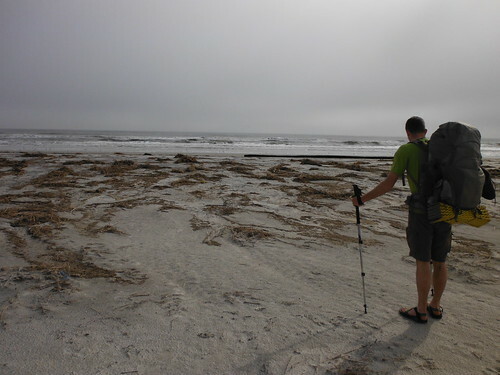 Perhaps that’s why the three-night backpacking trip my friend John and I took to Cumberland Island National Seashore so incredibly exceeded the reasonably high expectations we had set. We arrived at the island around 12:30 p.m. (we departed St. Marys, Georgia on the 11:45 a.m. ferry; only passengers are allowed on the ferry, no private vehicles) and received the required, and fortunately brief, orientation lecture and our backcountry camping permit from the ranger. Within 15 minutes we were sauntering down the Parallel Trail to the backcountry campsite at Hickory Hill, about five miles away. We probably made it less than 1,000 feet down the trail before we stopped to just stand still and admire the intense beauty of the landscape. At the risk of sounding cliche, it felt like we had stepped into another world . . . and in a way, I suppose we had -- the dense maritime forest of live oaks and lush understory created a stately and tropical ambience that immersed us in the landscape. Both John and I are no strangers to the outdoors and the sublime marvels held in nature, but the awe we felt at hiking underneath the impossibly bent and curved live oak branches, draped in Spanish moss and covered in ferns, seemed to be no less than if we had walked onto the moon. We were no less mesmerized by the charm of the forest upon arriving at our campsite than we were at the beginning of our hike. 5.5 miles of this type of trail led to our campsite and, somewhat surprisingly, it never got boring to hike through such a uniform landscape. The campsite was a “zone” campsite according to Park Service regulations, meaning that we were allowed to set up anywhere within 150 feet of the post marking the campsite. We were both able to find adequate spots to set up our small backpacking tents and then proceeded to snack and lounge around in the pleasant weather. Highs for the day had been in the low 70s and the nighttime low was forecast to bottom out in the low 50s. Similar weather was forecast for the next few days we would be on the island. While relaxing in the shade of the live oaks and hickories, with a brief expenditure of energy to follow an armadillo that we heard scurrying through the brush, we discussed our plans for dinner. Initially, we had assumed we would simply dine at our campsite. However, eagerness for the beach got the best of us and we decided to make a three-mile round trip hike to enjoy a beachfront dinner. As dusk began to settle onto the island, we began our trek on the Willow Pond Trail to the beach. Campsite at Sea Camp Campground; none of the campsite pictures at Hickory Hill turned out well. 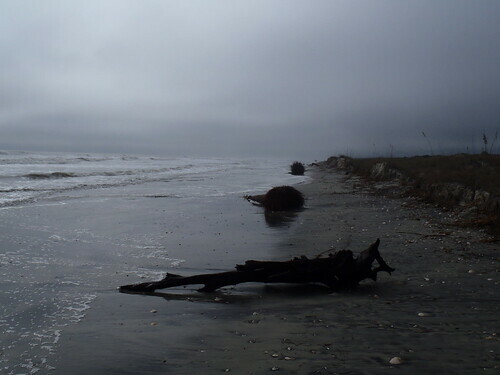 Author’s note: The following paragraphs are an account of the mistakes made and misfortune encountered on our hike to the beach; if you’re not interested in reading such an account then skip to below the next photo-insert. With slight embarrassment, I must admit that this "easy hike to the beach for dinner" contained certain elements that could classify it as a minor debacle in a few regards. It started out well enough, perhaps even better than well, which might have given us a false sense of confidence. 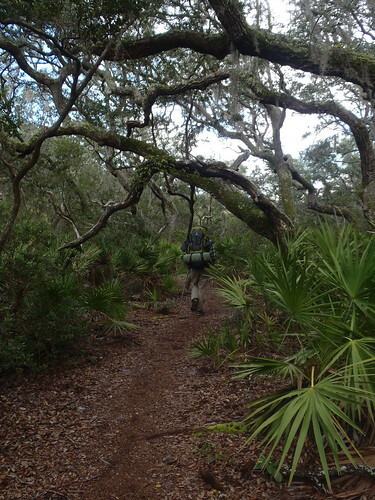 The terrain was flat, the wilderness trail was easy to follow (we had entered the Cumberland Island Wilderness on the way to our campsite after hiking about four miles from the dock where the ferry dropped us off) and the forest was bathed in the charm of twilight. All we were thinking about was how beautiful the island was, how different the landscape was from anywhere else we had backpacked and how great it was going to be to eat dinner (Italian Herb Pasta Roni with Herb and Garlic tuna packets) on the beach under the stars. At least that’s all we were thinking until we hit the sand dunes that separated the forest from the beach and realized that we (although since I was in front I suppose it would be more accurate to say “I”) had mistaken one of the horse trails for the actual trail and were significantly off-course. 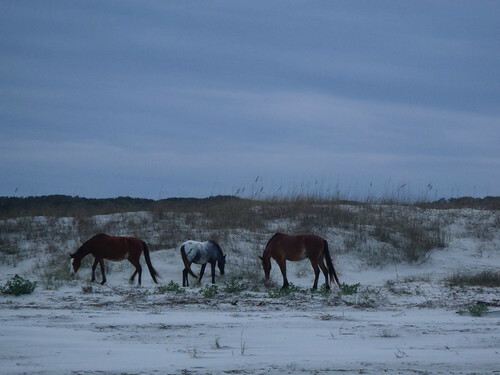 The feral horses on the island had created distinct paths that made it confusing to tell which trail was the official trail and which was a horse trail (especially at night illuminated only by headlamp); and given the wilderness characteristic of the footpath to begin with it became increasingly apparent that our beachfront dinner was going to be delayed. We both realized that we might have ended up hiking at such an angle on the horse trail as to be more parralel to the beach, rather than perpendicular . . . meaning that we likely needed to leave the horse trail to right our course and reach the beach. This prospect was made even more unappealing by the fact that the path we were on had entered a boggy section and our choice of casual footwear (John in Crocs, I was wearing Chaco sandals with wool socks) for the “easy” hike to the beach was less than appropriate. After a few deep breaths and choice words directed toward nothing in particular, we took stock of the situation and proceeded in the direction that we believed would lead us to the beach, which unfortunately was not the path of least resistance. A dozen minutes of trudging over and around sand dunes and their vegetation, and we arrived at the beach and watched the incoming tide lap at the sand within a few feet of where the beach ended and the dunes began. Here was where we really had to “roll the dice”, so to speak. We knew we needed to get back on the trail, which we would do by finding the black and white striped pole that marks the dune crossing and provides the easiest path from the beach back to the forest, and ultimately the trail to our campsite. The trouble was we weren’t certain which way to hike along the beach to find the dune crossing marker. Fortunately, our gut instincts proved correct and after about 300 feet of hiking along the little bit of remaining beach we hit the dune marker and our “ordeal” ended. Despite having to put in much more effort than we had anticipated, and an oversized appetizer of humble pie, dinner was very enjoyable. It was worth the struggle to look out on sand illuminated by moonlight filtered through the clouds and the tide rolling in, all while enjoying a meal. Our hike back to the campsite was much less eventful than our hike to the beach; we carefully and deliberately chose our path through the section where horse trails intersected the trail and made it back to our camp with full stomachs and tired feet. Wild horses at the junction of the Parallel Trail and Willow Pond Trail. Upon hitting the trail the next morning, we had our first up-close encounter with the feral horses on the island. 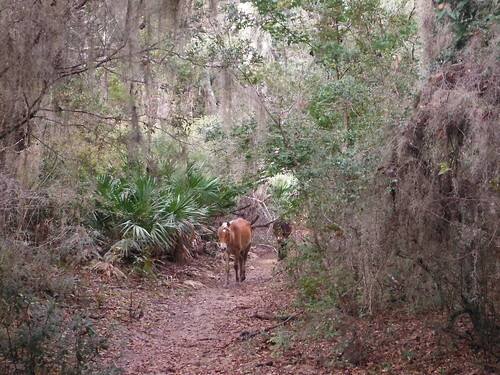 Two horses where ambling down the Parallel Trail near its junction with the Willow Pond Trail, which we would again use to reach the beach and hike back toward the south end of the island and our campsite, Sea Camp Campground, for the next two nights. Due to a managed hunt on the island, all the backcountry campsites and trails on the north end of the island were closed -- so our backpacking trip was turned into one night in the backcountry and two nights in the campground. After admiring the horses, we hiked toward the beach and recognized the precise spot, a 90 degree turn with a horse trail going straight, where we had gotten lost the previous night. Closer to the beach we briefly saw three small wild hogs rooting around in the dirt, which would be the only hogs we would see on the island. At the junction of the trail and the beach, two birders who were part of a bi-annual survey of the birds of the island were posted up with binoculars and notepads. We chatted for a bit with them before beginning our walk south. The tide was receding and we only had a few dozen feet between the dunes and the water, which made for an end-of-the-earth type of hiking experience, especially given the overcast sky and stiff breeze. It almost felt like if I wasn’t weighted down with my pack I’d be blown off the face of the earth. Needless to say, the two miles we spent hiking that section of beach sticks out in my mind as some of the most surreal hiking I’ve ever done. Wild horses on the beach. Taking a post-lunch break pause before hitting the “trail” again. We reached the campground in the early afternoon and were assigned out campsite. As a backpacker, I rarely camp at campgrounds but Sea Camp Campground was much better than I expected. 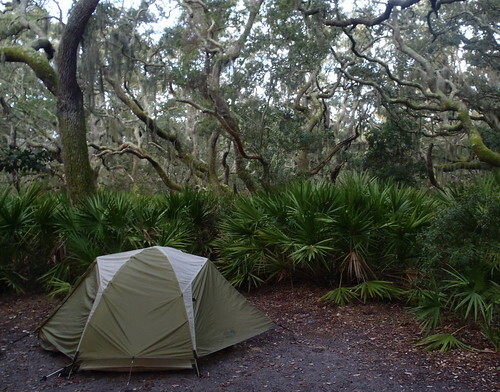 The dense and tall palmetto undergrowth provided a substantial amount of seclusion and sense of privacy at each campsite. The beach was just a few minutes walk away via a boardwalk. Flush toilets, water spigots and a sink for washing dishes added convenience to the relaxed atmosphere of the campground. 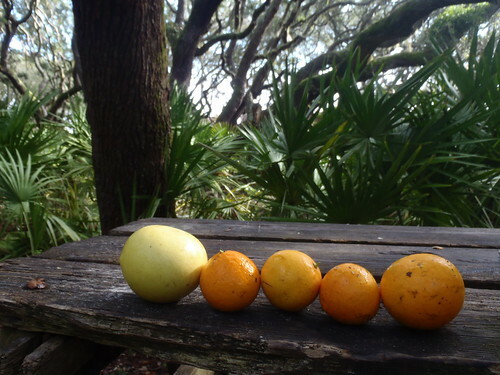 One of the most unexpected surprises at the campground were the ripe oranges and grapefruits on trees at our campsite and a few adjacent, but unoccupied, campsites. However, with nearly all of the low hanging fruit already picked by other campers we had to get creative in how to retrieve the remaining fruits that tempted us. Eager to re-establish my “trail cred” after the previous night’s misadventure, I racked my brain to figure out a creative way to get the fruits from the tree limbs to the ground. The solution presented itself rather quickly and was simply ingenuous (maybe I need another slice of humble pie) -- using the para-cord that I use to hang my food bag and a conch shell for weight, I threw the cord over a limb, let the cord extend until it was in reach, then crossed the cord to get a “grip” on the limb and shook it vigorously. Oranges dropped as expected and I was grinning like the Cheshire cat. We enjoyed the fruits of our labor (pun intended) before heading out to the beach, where we would spend the rest of the afternoon throwing Frisbee and returned to our campsite well after dark and ate dinner. Grapefruit and oranges picked at the campground. There are also tours available for the Plum Orchard Mansion and an African-American church on the north end of the island, which I hope to take on a future trip. After the tour, we hiked back to the Sea Camp Campground on the beach and took several breaks to throw the Frisbee and just lay around in the sun. It was sunny and the temperature was in the low 70s, so we waded into the ocean and threw the Frisbee for a bit in knee-deep water with the waves rhythmically pushing against us. It was chilly, but definitely not something I regret doing. We made it back to camp around dusk, ate our dinner and went to bed early as we planned to get up for sunrise the next morning. Sunrise on the beach, with a cup of coffee in hand and oatmeal to eat, has definitely become one of my favorite memories from a backpacking trip. There really isn’t anything that compares to sitting on a seemingly endless stretch of beach, looking out on a seemingly endless ocean, and watching the sun slowly rise over the horizon and into the clouds. As someone used to the landscape features of the Cumberland Plateau or the mountains of southern Appalachia, it was almost difficult to put the vastness of the ocean in perspective. In one attempt to do so, I made the illogical but amusing remark that “Looking at the ocean and the waves roll in is kind of like looking at a huge horizontal waterfall”, which was met with a blank stare and a delayed chuckle from John. Next time I think I’ll just let the feeling of speechlessness prevail and not try and remedy the condition. Once we finished our breakfast, we packed up our gear and walked the half-mile to the dock to wait for the 10:15 a.m. ferry. On the ride back we watched as the island grew smaller and eventually disappeared. I was already planning my return trip; I was scheduled to drop John off with family in Orlando, then hang out for a few a few days with him near the Ocala National Forest in north Florida, and then head back to central Georgia to visit with some of my family for Christmas. 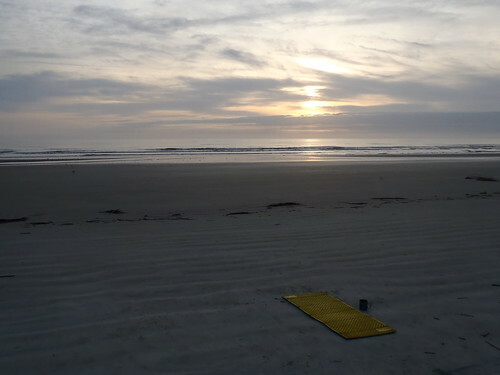 I planned a two-night trip to Cumberland Island on my way back and spent two nights at the campground from December 20-22, and a lot of time dayhiking along the beach. A few pictures from that solo trip were used in this trip report when no pictures from the original trip turned out well enough to use. 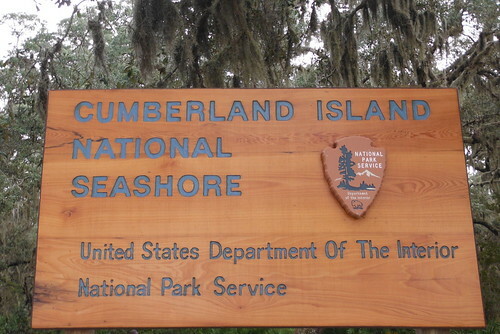 I’d definitely recommend looking into a trip to Cumberland Island if you enjoy camping and the ocean. I’ve never really considered myself much of a “beach enthusiast”, but this trip might’ve converted me to one. The sublime pleasure of having a section of beach to yourself and sharing it only with the occasional passer-by or wild horses (there were several times during my day hikes where I saw more horses than people, and I would only see a half-dozen or so horses) is really something hard to express. 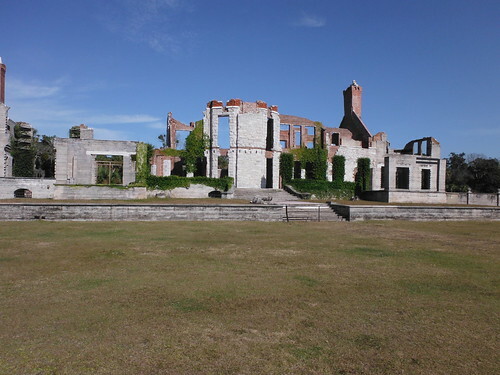 Planning a trip to Cumberland Island is somewhat involved in regard to logistics. It wasn't just a park-and-hike type of trip, or where you can just call in your plans like at Great Smoky Mountains National Park. Reservations for space on the ferry ($20 round-trip per adult) and camping are strongly recommended. Planning loop hikes is somewhat difficult given the layout of the island, and the fact that backcountry campsites are first-come, first-served so there’s not guarantee that once you arrive on the island you’ll get to stay at the sites you planned on. Water in the backcountry also requires decent planning, but nothing too extreme. Additionally, you have to be at one of the docks on the south end of the island to catch the ferry, so you have to factor that into your schedule and choice of campsites. Feel free to send me a PM with any questions. Mark W registered at Kywilderness.com on January 16, 2008, 05:24:57 AM and has posted 869 posts in the boards since then. Last visit was January 10, 2019, 10:39:58 AM.